The thoroughly entertaining The Switch comes across in its ill-conceived marketing campaign as a crass studio concoction, when in fact it's got more of an indie-spirit; it's funny, clever, touching and real. This should be no surprise as this terrific comedy is based on Jeffrey Eugenide's exceptionally conceived short story, The Baster (a much better title) about a woman who decides to have a baby on her own but doesn't realize it just may be the progeny of her best friend and unrequited love (Jason Bateman). The film's producers brought us Juno and Little Miss Sunshine, both critical and box office successes for Fox Searchlight, but as a leftover from the remains of the original Miramax subsidiary of Disney, The Switch may get lost in the late August movie clearance sale. With any luck though it could and should eventually find its true audience through good old fashioned word of mouth. Hopefully Disney will hang in there and give this one a chance to breathe. A well-cast Jennifer Aniston plays 40ish Kassie, a woman longing for the joys of motherhood and feeling the pressure to start despite not having a serious relationship with a man. 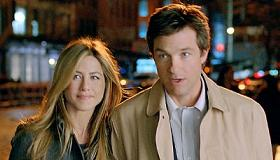 The closest thing she has to male mate is her best friend, the hapless but likeable Wally Mars (Jason Bateman). It's a sign of deep trust that Kassie asks Wally to help her find the perfect sperm donor, and a fairly big rejection because sadly, that donor is not gonna be him. Or is it? Kassie picks an easy going if egocentric guy named Roland (Patrick Wilson) to provide the juice but at an "insemination" party the drunken Wally stumbles across the sample in her bathroom and in his totally inebriated state accidentally destroys it. Wally's "fix" is to replace it with his own. As he was drunk, he doesn't remember this event...until years later, when he strikes up a relationship with Kassie's son, Sebastian, a precocious chap who seems so much like him Wally becomes convinced he is the real father. But how does he break this news to his best friend and mother of his "child?" Although The Switch provides lots of genuine laughs, thanks to Allan Loeb's smart script and a comically gifted cast, the premise which could have gone in farcical directions always stays real and true to itself, grounded in a reality that keeps us rooting for its characters and their odd predicament throughout. Aniston isn't stretching here by any means but this is the most appealing she's been onscreen in a long time. Bateman is the perfect counterpoint to Aniston, nailing this sad sack and making us care despite neurotic and sometimes boorish behavior that doesn't always make him the ideal best friend. They are great together. Scoring major points in a few choice scenes are the "couple's" confidantes, Juliette Lewis as Kassie's tart BFF and a dry and hilarious Jeff Goldblum as Wally's stock trading partner, ever helpful with some not-so-wise advice. Wilson also adds spice and a nice touch, turning a potentially thankless role into something more. The Switch turns out to be a sweet surprise. Adult audiences looking for an intelligent romantic comedy are likely to love it.